As the summer rages on, it is the time to protect your hair from the brunt of heat. 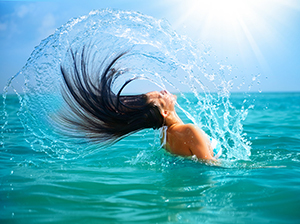 We have for you some tips that’ll help you keep your hair happy and healthy all summer long. Summer means vacations, sunbathing, beaches and tanning. But summer can also be about skin and hair damage. 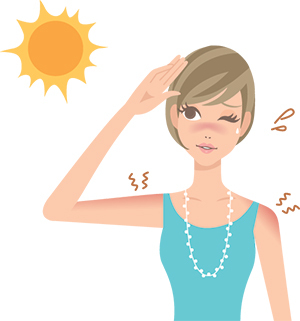 While we all know how to protect our skin from the heat, it is our hair that is often ignored. With mercury soars high it gets harder to keep your hair looking clean, shiny and damage free. Spend a day on the beach and hair that was soft and shiny, looks and feels fried. How does sun damages your hair? Average water content of healthy hair is 10-15%. The summer heat tends to evaporate this water, leaving your locks dry and damaged. Dry hair ends up soaking extra humidity, causing hair shaft to swell and break into the cuticles that result in frizzes. On top of that there are UV rays that damage hair in many ways. UVA - Penetrates into the hair's deepest inner layer and affects hair strength. These rays can also burn the unprotected scalp and activates free radicals, which accelerates premature greying. UVB - Leads to a loss of hair protein and colour changes. It can also damage the hair cuticles causing breakage. But, the sun isn’t the only problem. Swimming affects hair quality too. Chlorine in pool water and heavy salt content in the seawater strip your hair of its natural oil and moisture – both of which are essential for protection. If you're a blonde, then you can end up with an appalling greenish cast on your hair, which is caused by the molecular reaction between copper and pool chemicals. So, it is essential that you protect your hair on the sunniest of the spring and summer days. It just takes a little TLC to have great hair days all summer long. Here are some hair care tips that can get your hair ready to beat the heat even on the hottest of days. Probably the easiest way to protect your hair from the glaring sun is to cover them using a scarf or hat. While protecting your hair from UV rays, a scarf or hat helps keep the scalp healthy by retaining the moisture. If you are on the beach, then a scarf will also shield hair from the wind that can cause tangles, which can further result in damages and breakages. Want to keep it stylish? Fold a large scarf to create a triangle and place the straight end over your forehead. Now wrap the ends on the back of your head and cross them over without tying a knot. Now bring the loose ends in front and tie them at the forehead. Tuck the remaining loose ends into the scarf and you are all set to rock a great summer style. You can try many other ways of wearing hair scarfs and hats to suit your style. There are many sun protection filters that can protect hair from UVA and UVB damage. You can choose to use physical filters that sit on the hair and reflect UV rays. Alternatively, you can go with chemical filters that absorb UV rays and prevents them from penetrating and damaging hair. You can find these sun filters in many hair care products that protect hair from sun damage and keep coloured hair from fading. Don’t want to use chemicals? Consider using all-natural UV protectants like sunflower. Massage sunflower oil into your hair before sun exposure. Oil of sunflower not only protects hair from UV rays but it also provides the much needed moisture to your tresses. You can also switch to shampoo and conditioner with added UV protection with sunflower. Oily scalp can attract more sun damage as heat tends to activate sebum glands to produce more oil. Lots of oil and sweat can make your hair appear dirty and greasy. The best way to beat oil build-up is to frequently shampoo your hair. To prevent dryness and frizzes, use a moisturizing shampoo and follow up with a conditioner. If your hair is coarse and curly, frequently shampooing in summers can make them unmanageable. Tame your curls by applying a generous amount of leave-in conditioner after shampooing. Should you wash hair daily? No, after a day at the beach, rinse your hair and follow by giving yourself a scalp message. This increases blood circulation in the scalp that promotes hair growth and helps remove any product build-up. Let’s be honest. No matter how careful you are, summer is going to take its toll on your hair. So, it is wise to be prepared to fight problems like dryness, split-ends, frizzes and green pool hair. Consider adding deep conditioning treatments once a week into your hair care regime to add moisture. You can also try hot oil rinse to get back the shine in your tresses. Got green pool hair? Try rinsing out your wet hair with a quarter cup of apple cider vinegar and 2 cups water. This will help you eliminate discolouration and dullness. To prevent green crust from depositing on your tresses, get your hair wet before entering the pool to prevent the absorption of chlorine.